Powers/Abilities: Judge Mental can project his thoughts across great distances, as well as receive transmissions from others. However, he cannot read another's mind unless they are deliberately sending their thought to him. He can use his power as a weapon, transmitting great mental pain or horrific images into others. He can also control others to a degree, preventing motion or the use of paranormal powers. He could use his powers to shield others from certain types of powers (or perhaps this was another paranormal under his direction). History: Judge Mental organized the Forsaken, as a society in which paranormals could live in safety, protected from the outside world. 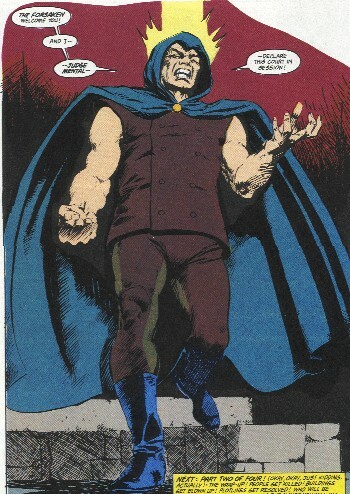 (Justice#25) - Judge Mental hired Quill and sent him to assassinate Justice--who was murdering paranormals whom he saw as using their powers inappropriately. He used his powers to make Quill immune to Justice's powers. (Justice#26) - Judge Mental caused Quill great psychic pain for failing in his first attempt to kill Justice. (Justice#30-BTS, 31) - As agents of the National Security Council--Chauncey, Playback, and Shudderbug--investigated reports of paranormals around Coney Island, Judge Mental had them captured by the Forsaken and brought before him. (Justice#32) - Judge Mental sent Impact to blow the National Security Council HQ. Captain Brooklyn infiltrated the Terminus and attempted to free the prisoners of the Forsaken, but Judge Mental had Seraph kill him. Justice and his daughter, Angie, allowed themselves to be captured. 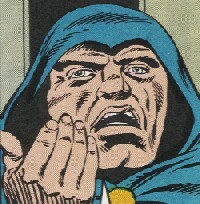 Judge Mental used his powers to suppress Justice's powers and then bragged of his own abilities. However, Justice realized that Judge Mental could not read his mind because he did not know about the gun in his pocket, which he then used to shoot and kill Judge Mental.